The Photon Fuzz MK2 gets its name from an active component in the circuit that utilizes infrared light to control the fuzz distortion element. Light is made up of photon particles, so the name represents the action that is at the heart of this very unique fuzz circuit. 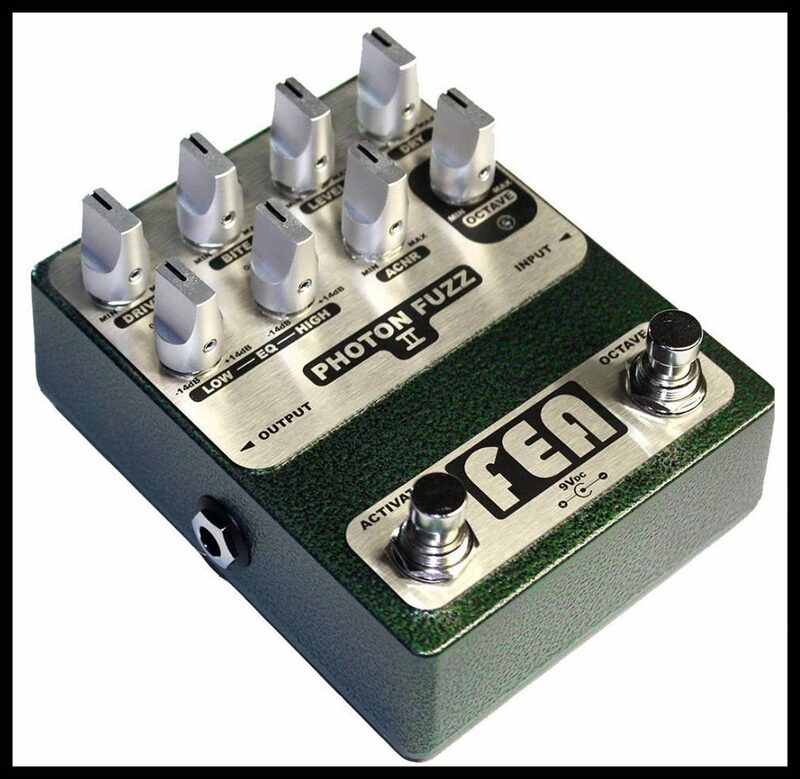 The Photon Fuzz was designed with versatile features for both bass and guitar players. There are three controls for the fuzz and its level, with a 2-band EQ to shape the fuzz tone. A dry blend level control is included for bass players and there is an octave distortion level control that is selected via footswitch. The ACNR (Active Coring Noise Reduction) control covers a wide range, from no affect on the fuzz signal, to a gated fuzz effect. The two controls that define the type and depth of fuzz are the drive and bite. The drive control sets the overall gain for the signal in the distortion circuit. The bite control sets the activation point where the fuzz distortion engages upon the signal and it behaves differently for lower and higher drive settings. Using the bite control with lower drive settings will give the player dynamic fuzz that will react and clean up well with the signal from the instrument. With higher drive settings the bite control will set depth of fuzz and sustain. This combination of two controls for the fuzz distortion allows for a wide range of textures from classic to modern. For bass players there is a dry level blend. The blending of a dry signal with the fuzz is useful to restore the lower bass frequencies that can get masked with heavy fuzz. This blend control is also very useful for players that want to retain their instruments natural sound and only need a bit of fuzz to cut through a dense mix. The dry signal has two low-pass filters that are selectable from the DIP switch located on the back of the circuit board. This allows the user to run the dry signal with the full audio spectrum or with the higher frequencies filtered. The filters have cut-off frequencies of 1600Hz and 160Hz. The 2-band EQ is an active Baxandall boost/cut design. The EQ is only applied to the fuzz signal, so that your dry signal remains natural. 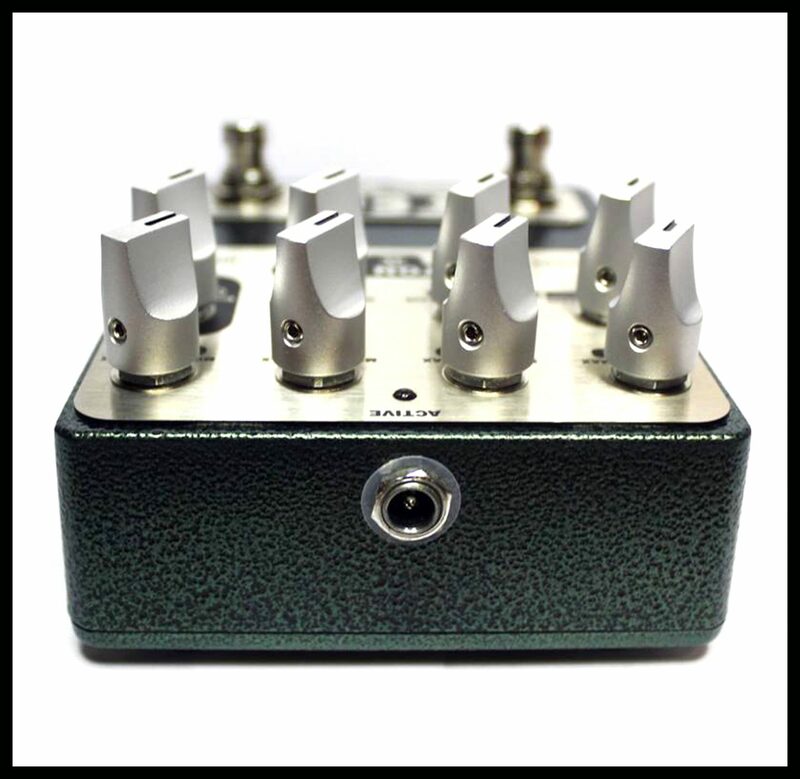 The octave distortion is selected by a footswitch. The octave is a full-wave rectifier distortion circuit located after the fuzz and its 2-band EQ circuit. This circuit acts as a distortion intensifier of the fuzz, which is ideal for busting out into a solo. As with the dry signal blend, the octave signal also has two low-pass filters that are selectable from the DIP switch on the back of the circuit board. The filters have cut-off frequencies of 4000Hz and 500Hz. These filters are useful to tame some of the high frequency artifacts that this octave distortion method generates. The Photon Fuzz uses two quality op-amp buffers and electronic switching for its bypass circuit. The buffered bypass is designed to be very low noise with no tonal coloration. The dual rail power supply in the Photon Fuzz is built on its own discrete circuit board to physically separate it from the audio circuits. This power supply provides 18Volts (+9V and -9V) to the fuzz circuit board to provide plenty of headroom for the signal. 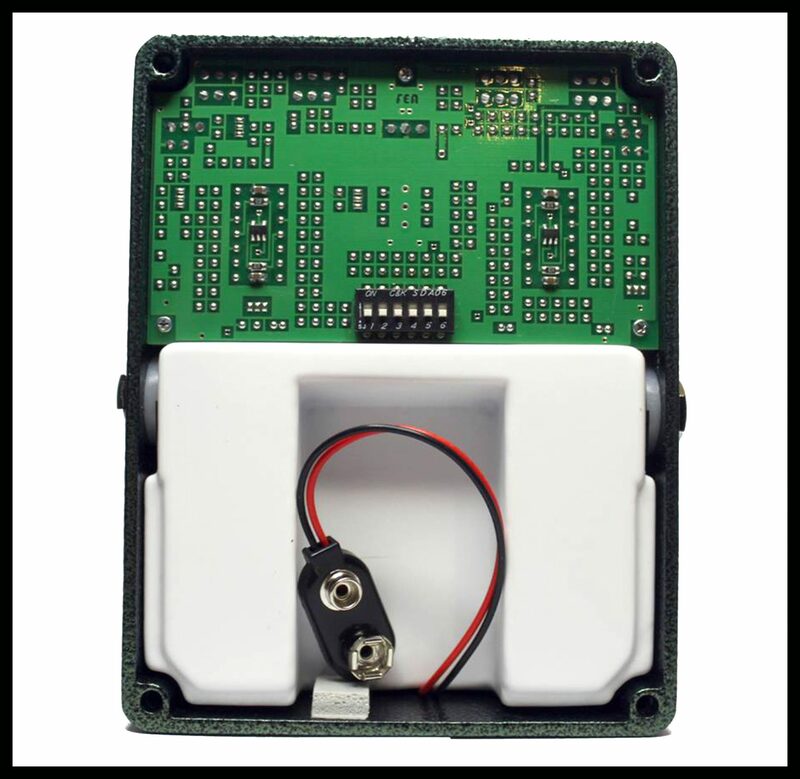 The power supply generates this dual voltage from a 9VDC power adapter or battery. DRIVE control to adjust the fuzz signal gain for depth and sustain. BITE control selects the point where the “photon clipping” engages upon the signal. LEVEL adjusts the fuzz output level. LOW and HIGH boost/cut EQ controls for the fuzz tone. 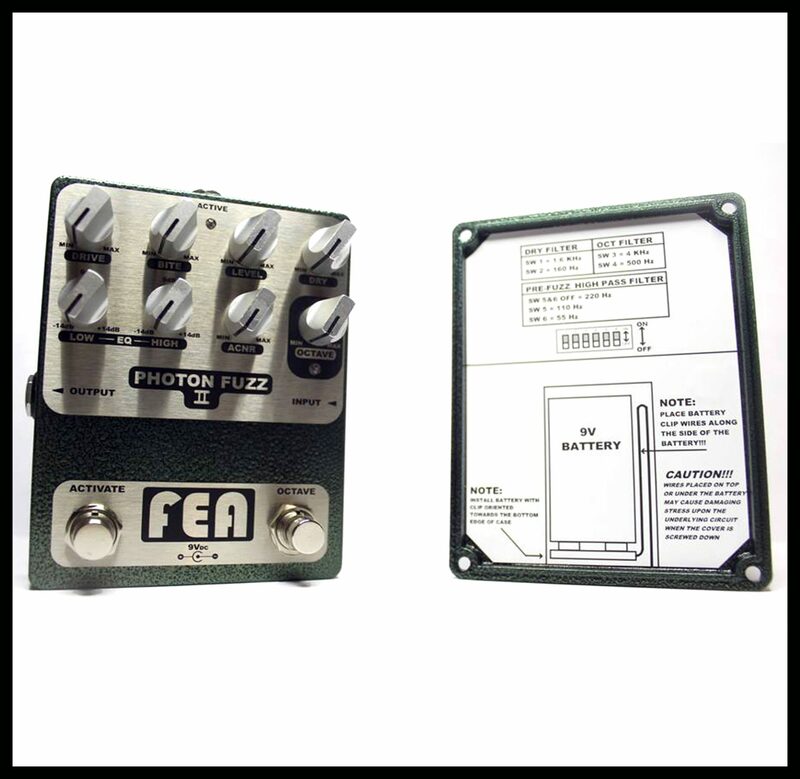 ACTIVATE foot switch places the Photon Fuzz in the signal chain or in buffered Bypass mode. 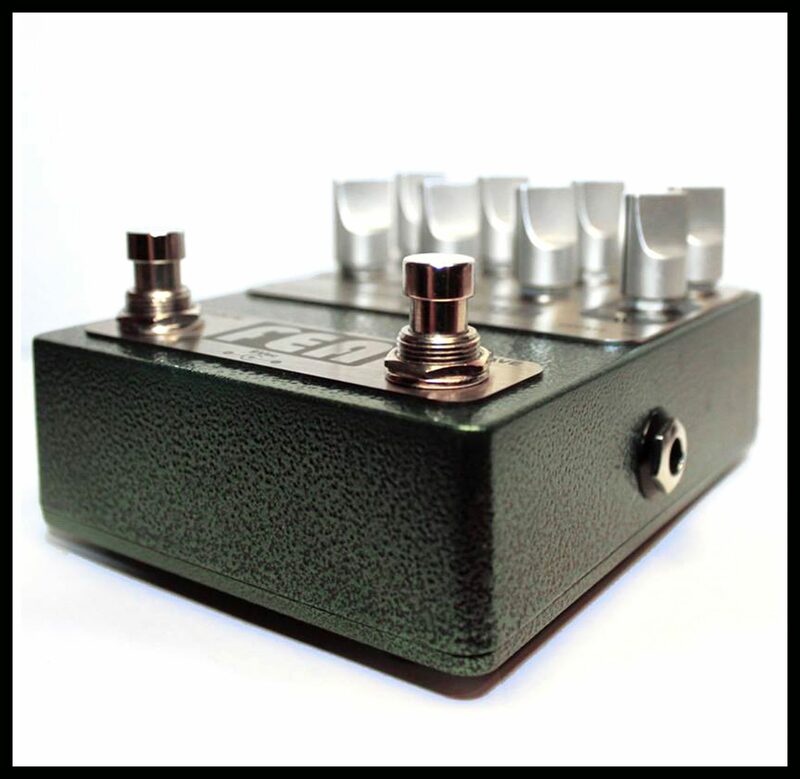 OCTAVE foot switch activates a post fuzz and EQ octave-up type of distortion. OCTAVE control adjusts the level of the octave-up distortion when activated. DRY control sets the level of the clean dry signal to be mixed with the fuzz distortion. ACNR (Active Coring Noise Reduction) control sets a dead zone around the zero crossing in the amplitude of the fuzz signal. This allows for no dead zone, to a small zone for noise reduction, to a wider zone for a gated fuzz effect. Two DIP switches provide three selectable pre-fuzz high-pass filter frequencies of 55Hz, 110Hz and 220Hz. Two DIP switches that select the octave distortion high frequency cut-off for full-band, 4KHz or 500Hz. Two DIP switches that select the dry signal blend high frequency cut-off for full-band, 1.6KHz or 160HZ. The power supplies onboard voltage charge pump allows the circuitry to operate at 18volts (+9 and –9 volt rails) from a single 9 volt battery or 9 volt DC power adapter. This allows the signal plenty of headroom from active electronic guitars and aggressive playing techniques. The “switch on” power supply current is less than 1µA (micro amp) on the signal ground at the INPUT jack. This is approximately 45,000 times (-93dB) less than the commonly used method of connecting the battery’s negative terminal to ground via the sleeve of the plug inserted into the INPUT jack. The “switch on” sensing method used in the FEA PHOTON FUZZ keeps nearly all of the circuit’s generated white noise and transient currents out of the INPUT stage signal ground. Extreme measures have been taken to keep the power and signal paths as clean as possible.